With the busy and rather unhealthy modern lifestyle, it is very easy for us to miss the vitamins and minerals that our body needs on a daily basis. The natural ways to get these nutrients are usually from a variety of foods, such as fruits, vegetables, and milk, but sometimes we just don’t have the chance to get these foods. That’s why a multi-vitamin supplement can be a great help for us. With a decent multi-vitamin supplement, we can support our own body to make sure that we get the vitamins and minerals that we need. Here, we are going to discuss about two multi-vitamin supplements currently popular on the market. 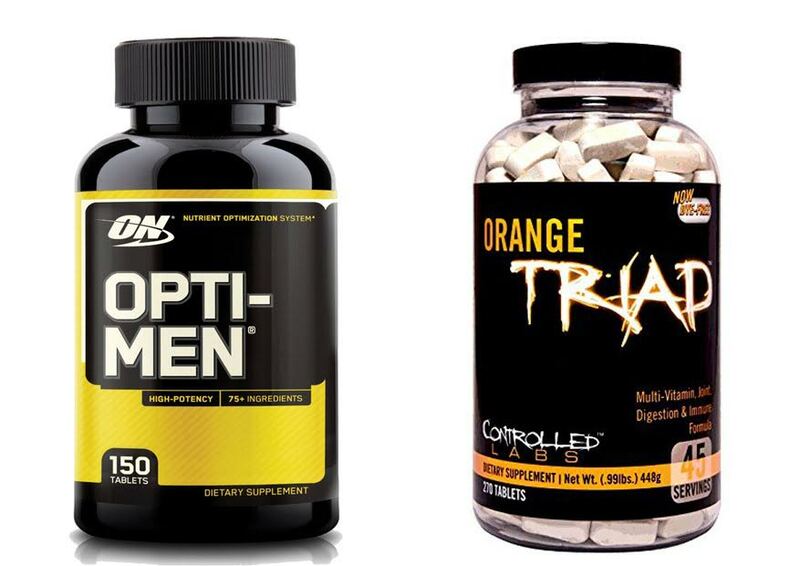 Opti Men has been considered as a quality supplement because of the rich blend of vitamins and minerals. On the other hand, Orange Triad is a relatively new product that offers multiple benefits. Which one should you get? Opti Men is a multi-vitamin and mineral complex that is aimed to support your bodily functions by providing the much-needed daily nutrients. It contains rich ingredients. It comes with the Amino Blend, which includes eight free-form amino acids which are needed as the building blocks of muscle proteins. It also has the Viri-Blend, a formula of eight botanical and marine concentrates; the Phyto-Blend, a mix of over 20 fruit and vegetable concentrates; and the Enzy-Blend, which features four specific enzymes. It is further enhanced by 350+ milligrams of B-Complex vitamins. Seeing the nutritional facts, you can indeed see that Opti Men indeed contains lots of vitamins and minerals. Hence, we can be certain that the positive reviews don’t lie. Unfortunately, the company recently has just changed the formula. The product now comes in smaller tablets, and the contained nutrients are slightly lowered. On the other hand, we have Orange Triad. Orange Triad is also a multi-vitamin and mineral complex, but it claims to deliver additional benefits of enhancing the health of the joints, digestion, and immune system. Checking the nutritional facts, Orange Triad indeed contains lots of vitamins and minerals as well. However, there is also the Joint Complex formula, featuring Glucosamine Sulfate and Chondroitin Sulfate to enhance the joints’ health; the Flex Complex formula, containing MSM, Bromelain, and Hyaluronic Acid; and the Digestion and Immune Complex formula, which features ginger extract, quercetin, R-Alpha Lipoic Acid, Blueberry, Pomegranate, Grape See,d Raspberry Seed, Lycopene, and Lutein. Orange Triad has received positive reviews from the users. - Viri-Blend: 8 exotic botanicals and marine concentrates. - Phyto-Blend: Over 20 fruit and vegetable concentrates. - Enzy-Blend: 4 specific enzymes. In addition to the additional joint and immune benefits, the recent formula change of Opti Men also makes another reason to choose Orange Triad. Therefore, we recommend you to choose Orange Triad, which is rich in vitamins and minerals, and is enhanced with formulas for joint, digestion, and immune system health.